Comprehensive Dental Care for All Ages. 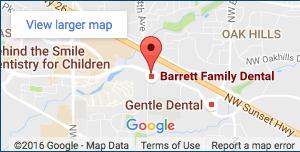 The term ‘Barrett Family Dental’ or ‘us’ or ‘we’ refers to the owner of the website whose registered office is Barrett Family Dental 1865 NW 169th Pl / Ste #120, Beaverton, 97006 The term ‘you’ refers to the user or viewer of our website. All trademarks reproduced in this website, which are not the property of, or licensed to the operator, are acknowledged on the website. Unauthorized use of this website may give rise to a claim for damages and/or be a criminal offense. Your use of this website and any dispute arising out of such use of the website is subject to the laws of Oregon, United States.